Guide price is per person. Based on 4 people sharing for 7 nights on Self Catering. Flying from selected regional airports with year round departures. Golf del Sur on the south coast of Tenerife is the top choice for an activity based holiday. It’s only fifteen minutes from the airport and as the name suggests it is great for golfers, it’s also popular with divers and even if you are not the sporty type the relaxing atmosphere offers a great place from which to enjoy the year round sunshine. Golfing holidays to Golf del Sur offer the chance to play on the championship course where the Tenerife open takes place. There are 27 holes here all offering different challenges and after a hard day on the course the club house is a welcome place to stay out of the heat of the day. The beach at Golf del Sur is mainly shingle but there are sunbeds to enjoy the warm days. For much larger beaches many head into the nearby neighbours of Los Cristianos and Playa de las Americas where there is ample space to stretch out in or to try your hand at one of the many watersports on offer. Golf del Sur holidays are perfect for divers with over 50 dive sites located off the island of Tenerife. The Atlantic Ocean offers some fantastic sites and the Amarilla Divers have a PADI dive centre in Golf del Sur that arrange daily boat trips. Off the coast you can see rays, turtles, lobsters and if you are very lucky, whales or dolphins. The marina and resort centre offer a low key selection of bars and restaurants that are laid back and perfect for relaxing after a day of sporting activities. 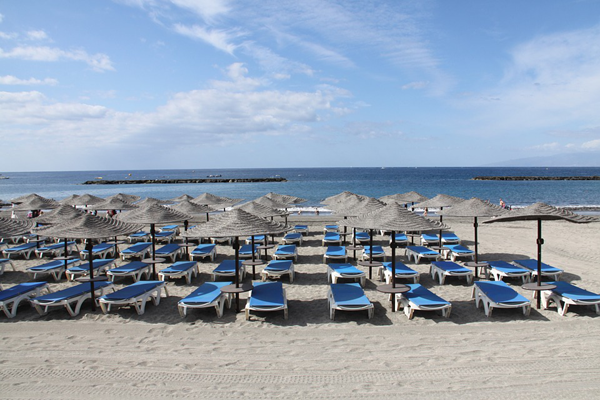 For a much wider choice Playa de las Americas is around twenty minutes drive away and reached by taxi. Many tourists hire cars to explore this gorgeous island, with its craggy west coast, the beautiful national park or the volcanic centre topped off by the world’s highest volcano – Mount Teide. Take a holiday or short break to Tenerife and find some great deals on our website or call us and speak to one of our friendly travel experts today.